In the pink and cloudy womb that is giving birth to stars, this strange translucent slab of quite unnatural structure may be the embodiment of our own species, some millions of years from now, on our way to a new home in the cosmos. As if in a dream, it heads into the brilliant glare of a distant sun emerging from behind a ringed planet that is partially veiled by the seemingly turbulent nebulous environment. 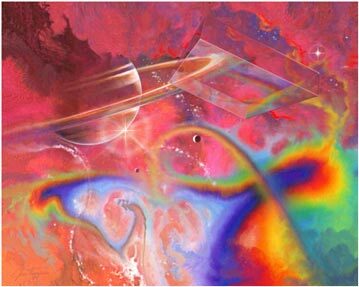 What composes the colorful arch of dust and gas below is left to the imagination. Out of such chaos may come life and form more wonderfully unfamiliar than anything one might be capable of imagining. Other nearby stars and planets offer mysteries that await our new arrival, as we settle in some strange new world, to continue the business of life, evolution and discovery. All text & graphics copyright ©1985, 2004 by Jim Thompson. Html Coding & Web Development copyright ©2004 by Bardic House.